We think this is the perfect bed for a Doberman. That is, when he's not in your bed. 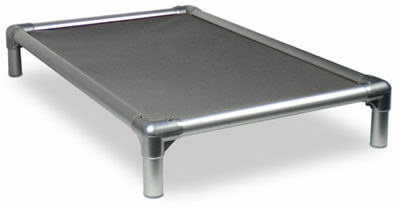 The Kuranda dog bed is durable, pretty darned indestructible, and comfortable. We think it's the perfect Doberman bed. They come in a variety of fabrics including mesh that lets air pass through freely -- ideal for hot weather and for Dobermans who are incontinent. We've had a few Dobermans who suffered from incontinence and we struggled with the realities that came along with that challenge (soaked mattresses, etc.) but we couldn't stand to have them sleep on the floor. This was an ideal bed. We could place a towel underneath the bed to absorb what leaked during the night and/or a simple pan/tray from a wire crate. Then we could rinse it out in the morning, spraying the bed clean of any urine. Simple. Practical. And comfortable.